Stop chasing food around the grill, or burning your arm because it takes too long to flip it. Spatulas, tongs and forks are only good for certain types of food, and even when considered ideal, they can cause more frustration than necessary. It's pretty hard to turn a hot dog with a spatula, and flipping burgers with a pair of tongs is not very easy either. You will either ruin your food by squishing it, or burn it because you can't flip it fast enough. The amazing utensils in this Boxed Set can be used on any type of food, and they offer a quick and easy way to adjust, rotate and flip anything you are grilling. Long stainless steel pokers are curved for performance, and sharpened to a fine point. Your choice of comfortable handle completes the other end to provide a cool and comfortable way to control the tool. Instead of multiple utensils at the grill, you can use just one to eliminate clutter, reduce clean up time, and cook all of your food faster and with less effort. 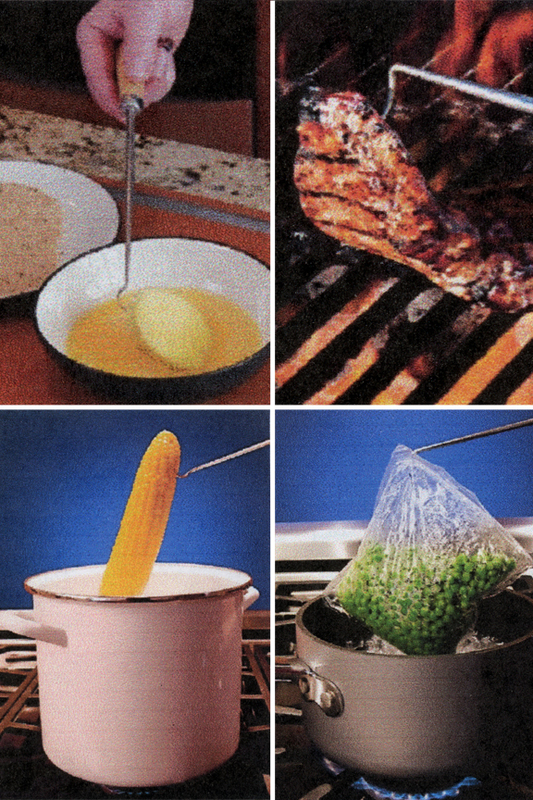 It may have a funny name, but this revolutionary cooking tool is one of the best available. The Pig Tail Boxed Set is ideal for gift giving, but also nice for storage purposes. Any dad, grandfather or grill nut would love to receive this set for a special occasion, but many people might prefer it over the regular set for themselves as well. The convenient storage box is made out of sturdy wood, so it will keep your flippers safe and protected when not in use. It does offer a nice presentation for gifting purposes, but the usefulness of the box will last for the life of the tools. Instead of hanging them off the grill, tossing them in a drawer, or dangling them from some hook, you will be able to store them safely inside the box. This will keep them clean and undamaged between uses, and allow you to store them in the garage or basement without worry. Sturdy construction means the box will hold up for years, and metal hinges and latch will allow for easy operation and increased security. This boxed set includes the same tools as the regular set, so if you want to spend less, or get it without the wood box, then check out the regular 2 Piece Food Flipper Set. The set featured here includes one of each size flipper. If you only want one or the other, then we also sell them individually here: Large Food Flipper - 19" & Small Food Flipper - 12". This set includes two food flippers. One is shorter than the other, but they both feature the same tapered, "pig tail" point at the end. Some people may prefer one over the other for certain tasks, or you may want to keep one in the kitchen, and the other one outside by the grill. A simple flip of the wrist will allow you to gently puncture food in order to grip it and then flip or re-position as necessary. It will not ruin food thanks to the sharp and precise tip, and because it is perfectly angled, it will make maneuvering your food on the grill a quick and simple task. 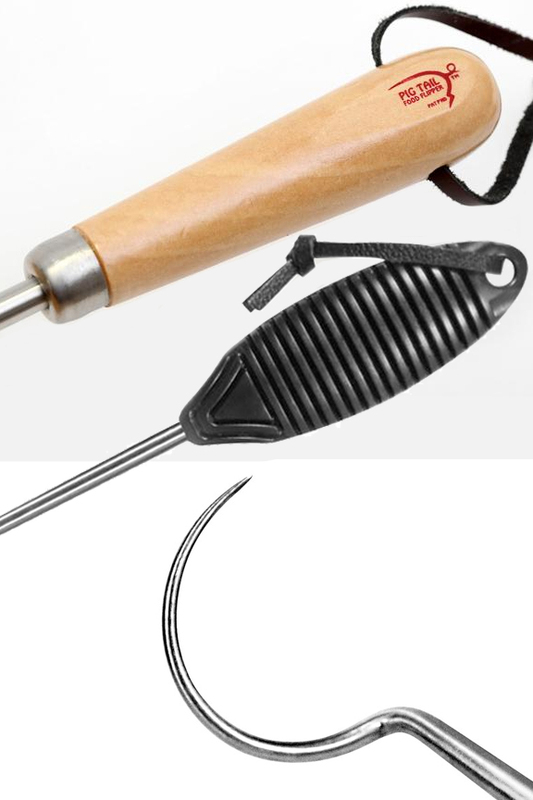 Use either size flipper for grilling outdoors, but the smaller one is also useful for cooking inside at the stove. Because these utensils are so much more efficient than traditional ones, many people find themselves doing a whole lot more than just grilling with them. Use it on the grill for a rack of ribs, hot dogs, veggies, steaks, burgers or chicken. 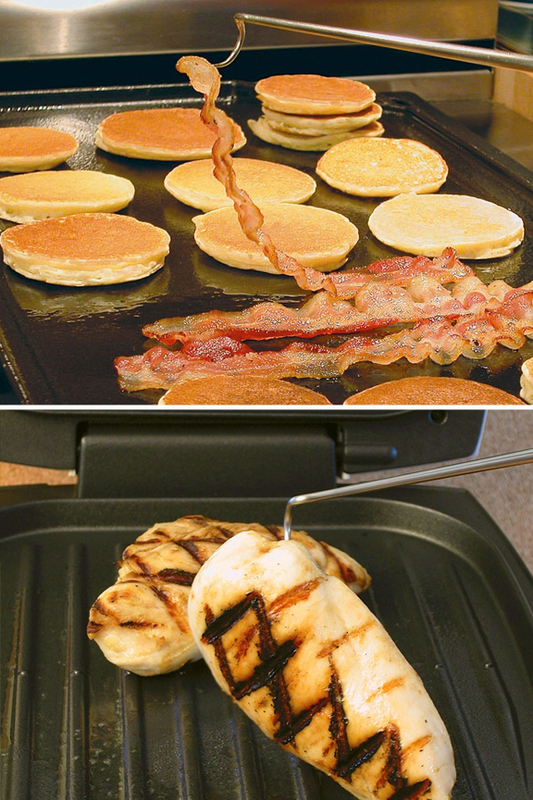 Take it inside to turn bacon, cook baked potatoes, flip french toast and more. Comfort grip handles keep your fingers cool and comfortable while cooking, and an ample reach keeps you at a safe distance. There is a bit of a technique involved, but after one or two uses, anyone will be cooking like a pro and looking like one too. Save time, reduce frustration, eliminate messes and end up with better looking food. These food flippers are so easy to use, and they allow for effortless cooking when compared to more traditional utensils. You can use the same flipper for multiple food types thanks to the versatility they offer, and using them will be quicker and easier in comparison. There will be no more scraping up grease or pushing food to the edge of the grill when using a spatula, and no more dropping food, pinching it too tight, or letting it slip like when using tongs. Switch to these utensils and you will wonder how you ever got along without them. It doesn't matter what size or shape your food is, or what type of marinade or sauce you may have on it. Because of the unique design of these food flippers, you will be able to avoid common annoyances while cooking or grilling. Ideal for any kind of meat, but also well suited for other foods like corn on the cob, grilled cheese and more. Choose these tools when cooking for just about anything you turn, flip or rotate. The Pig Tail’s hook and shaft are made of surgical-grade stainless-steel for strength and durability, and the hook will not leave marks in your meat or cause them to bleed. Includes: (1) boxed set. (1) large flipper, (1) small flipper & (1) storage box. 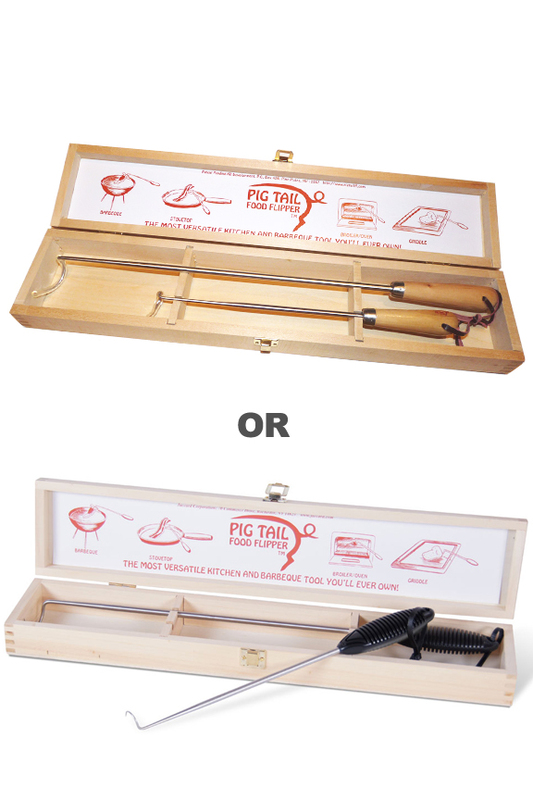 Pig Tail Boxed Set - The popular two piece set of grilling utensils in a wooden storage box. Eliminate spatulas, tongs and forks when you choose the best grilling tools available. Fast and easy flipping of any type of food. Very nice boxed set of Pig Tails. The Pig Tails are easy to use, comes in handy to flip and move the meat and to remove from grill. The box is really nice too. We gave a set as a gift to a family member and they are thrilled to have these as well. Classier than using a fork or tongs. Man I didn’t know how good this thing really is on a grill. Really happy that I got one. Makes flipping meat so much better. Very glad I bought one. Just yesterday, I gave this Pig Tail Boxed set as a gift to my daughter's boyfriend. It was a unique gift and he loved it and will be using it today. I tend to buy things that I would like for myself when considering what to buy for gifts. I have long thought that these were a cool idea. My brother and both sons-in-law all enjoy cooking for their families, so I bought these as gifts. I can't wait for the feedback. Initially, I was livid. After paying extra for the wooden handles, not only did I not receive what I paid for, I only received half of the set...so 1 plastic handle flipper in a box. I called the customer service number provided on the receipt to find IT DID NOT WORK! After scouring the website, I found another number and was immediately connected with a Live person. I was informed that it had to be a manufacturer error and the correct order was shipped via priority 2 day shipping. After getting lost in the mail, and dealing with the post office on that issue, I finally received my order on Christmas Eve. I was thrilled and they were great! My father and possible future brother-in-law loved their gifts. Thank goodness for the wonderful woman who helped right my order at no extra expense to me. Love them! They were as expected and on time. These flippers are Awesome !! Its amazing how well they work Highly recommend for anyone that grills and or smokes. My only issue was the item was advertised with wooden handles and the set I recieved had plastic handles. The plastic handles are sturdy and work well. We're not new to the flips. A pair of them are part of our BBQ set-up on the patio and my husband loves them. He ordered another pair and two more for gifts. Simply good Stuff sells them in a very nice wood case at a very good price.....in fact, the best price we could find anywhere on the internet or elsewhere. Thanks! This was a gift for my left handed brother and he loves it. He used mine (right handed) when he was out visiting and want one of his own. Couldn't find locally so ordered online and was happy to see there was a left handed set. Both the left and righthanded pigtails are strong enough to grab and turn tri-tips and rib eyes with no problems. Just press the add to cart button and proceed to checkout. If you are having trouble, please give us a call to place your order over the phone.